Winter can be a brutal time of the year for your lips. The cold air, the chilling wind and dry, heated air inside all conspire to make your smoocher dry and tight. 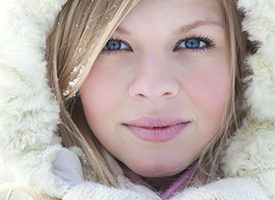 In addition, when we go out in the cold, the mouth is usually among the last things we cover up, says dermatologist Melissa Piliang, MD. Lips are a special type of skin that is thin and delicate – and so requires a little extra TLC, Dr. Piliang says. “Our lips dry out ten times faster than the rest of the skin on your face so it’s really important to use extra protection,” Dr. Piliang says. Use a lip balm that is ointment-based. This will lock in the moisture and help to heal cracks and splits in the skin. Look for a healing ointment that contains petrolatum, essential oils or glycerin. Another important ingredient is sunscreen — there still is sun in the winter. Avoid lip balms containing camphor, eucalyptus and menthol. These substances actually dry out your lips and make the problem worse. In response, you apply more of this kind of lip balm, and the cycle continues. Treat cracks right away. If you let them go, they can become worse and possibly get infected or lead to a cold sore. At night, apply lip balm before you go to bed. Many people sleep with their mouths open. Eight hours of breathing in and out through your mouth can dry your lips, Dr. Piliang says. Also consider using a humidifier at night if the air in your house is dry because of being heated.